See a mistake, or have a suggestion or comment? Contact us. 90,000. Canadians (mainly police, law-enforcement and military) allowed or required to carry loaded guns in daily life for personal and public safety. 10,000. Canadian youth aged 12-17 with licences to use, but not buy, firearms. 1,400. Target-shooting ranges in Canada. About the same as the number of hospitals. 1,000. New handguns, AR-15 rifles and other “Restricted” firearms bought in Canada each week. 365. Days each year that people with gun licences get a background check. 266. “Firearm-related” homicides in 2016, according to Statistics Canada. Fatal stabbings have exceeded fatal shootings this millennium. 16. Percentage of suicides by shooting, behind hanging/suffocation (44%) and poisoning (25%). 13. Percent of Canadian men who have a firearm licence, or almost one in seven. 10. Potential years in jail for not renewing your gun licence on time. 3. Legal classifications for firearms in Canada. 2. Team Canada shooters in the 2016 Summer Olympics. 2. Female Team Canada shooters in the 2016 Summer Olympics. 0. Number of violent criminals with firearms who obey firearm laws. How popular is shooting in Canada? Hunting for food and shooting for sport are at the heart of Canadian culture, heritage and tradition. Many people in northern or remote communities depend on hunting for survival. Farmers use firearms to protect their crops and livestock, and themselves. More Canadian men and women have a firearm licence than participate in the country’s most popular sports, from golf, hockey, soccer and baseball to volleyball, basketball, skiing, cycling and swimming. In 2010, 1.5 million adults participated in golf (the most-popular sport), and 1.85 million had gun licences. How many people own guns legally? 2.2 million men and women had gun licences at June 30, 2018. That’s about 7 percent of the country’s 29.7 million adults. Not all of them own guns, but all of them are allowed to. How many guns are in Canada? Individuals own an estimated 10 million – 20 million guns. No official data. What we do know: Canadian individuals own more than 833,170 so-called “Restricted” firearms (e.g. revolvers, pistols, AR-15 rifles) as of June 30, 2018. Including businesses and museums, it's more than 1 million. They bought 1,328 “Restricted” guns each week on average in the 12 months ended June 2018. The military, police and law-enforcement own hundreds of thousands more shotguns, rifles and handguns. How many target ranges do we have? Canada has an estimated 1,400 shooting ranges. Which big cities have the most legal gun owners? 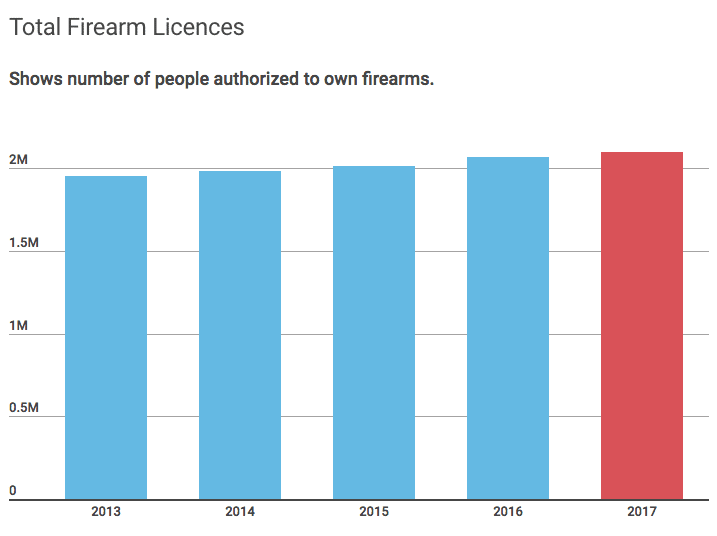 Montreal has the highest number of licensed shooters among Canada’s five-biggest cities, but Calgary has the highest rate of gun owners per capita. Who is allowed to own guns legally? To legally buy and own guns, and to buy ammunition, you must be at least 18 and have a firearm Possession and Acquisition Licence (PAL). A PAL doesn’t allow you to carry guns on your person for self-defence, and isn’t enough to use guns for hunting unless you also have a hunting licence. The Canadian Firearms Program, overseen by the RCMP. How do you get a gun licence? Take mandatory RCMP-approved safety course. Submit licence application and payment to RCMP. Pass background check (including mental health, spouse) and reference checks. Obtain licence card with photo. It typically takes about four months minimum to obtain the licence and costs $250-$500. Is it true that you get a daily background check if you have a gun licence? Yes. The RCMP calls this “continuous-eligibility screening.” Having a gun licence in Canada is proof that you aren’t a criminal. You can get a passport without a background check, but you can’t get a gun licence. Do you need a gun licence to go target shooting legally? No. Millions of men, women, children and teenagers legally shoot without a licence, under the supervision of licensed family, friends or range staff. What’s special about a gun licence? A firearm licence is one of only a few federally issued documents (e.g. PAL, passport, pilot licence, maritime licence.). You don’t need a background check to get a passport, but you pass one every day to have a firearm licence. What is Canada’s classification system for firearms? “Non-restricted” — many shotguns and hunting rifles. All three classes are highly regulated and restricted, and legal to own with the appropriate licence and authorizations. So “Prohibited” doesn’t mean prohibited. Are there different rules for each classification? Yes. The law sets out different rules to use, buy, own, transport and store different classes of firearm. For example, you aren’t allowed to hunt with a handgun or AR-15. If you want to legally take a handgun or AR-15 to the range, the guns must be unloaded, disabled with a trigger lock (or equivalent) and must be in a locked container. How many Canadians are allowed to carry guns on their person in daily life for self-defence? More than 90,000, mainly police, law-enforcement, military and armoured-car guards. Is it legal to use a firearm to protect life or property? Section 34 of the Criminal Code covers the lawful use or threat of force. Many factors are considered to decide if a response to a threat is justified. Section 34 doesn’t specify the tools that may or may not be used. See also the Technical Guide for Practitioners. How active are women in shooting? Women are active in shooting and rising, but less numerous than men. Team Canada sent two shooters to the Summer Olympics in Rio de Janeiro in 2016. Both were women. Women occupy leadership positions in several Canadian shooting organizations. How big is Canada’s gun industry? Canada had 4,495 firearm and ammunition businesses at the end of 2016, employing an estimated 25,000 people. Most are independent small businesses. Almost all guns and related gear sold in Canada are imported. Companies brought in almost 300,000 guns in 2016, with an import value of $135 million. At a hypthetical 25 percent markup, that would retail for about $170 million. 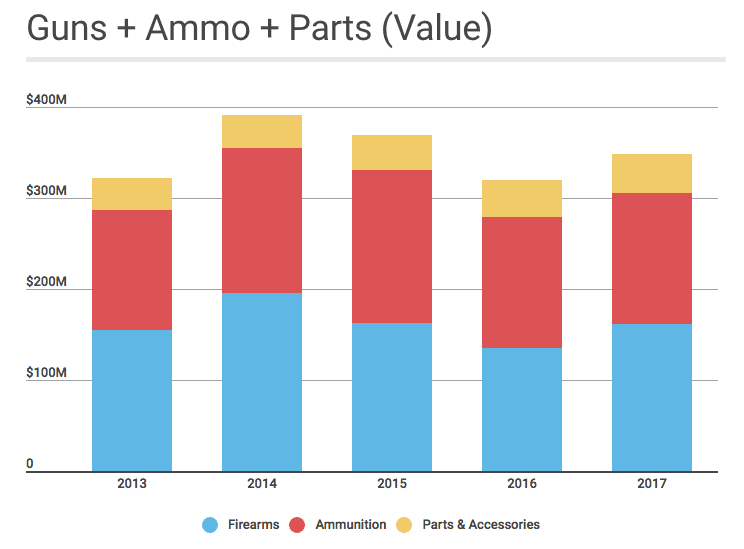 An indirect way of assessing the size of the firearm market is looking at Statistics Canada data on firearm, ammunition and parts imports. What is the relation between guns and crime? Many laws try to reduce violence by criminals (who disobey the law) through restrictions on hunters, farmers and target shooters (who obey the law). It doesn’t work. Street crime is increasingly being committed by gangs using handguns obtained on the black market. Legal handguns are tightly regulated. 422,887 Canadians have court-ordered prohibitions on possessing guns. Suicide: The leading methods of suicide on average are hanging (44%), including strangulation and suffocation; poisoning (25%) and shooting (16%). Compare vehicles: 2,000 killed, 10,000 seriously injured, 160,000 total injured. Gun and Gangs: Presentation to Summit on Gun and Gang Violence. Ottawa, March 2018.